An Excellent Big Bang for the Buck! I received this watch quickly from Overstock and discovered it to be a proverbial "diamond in the rough." Also reasonably priced -- i.e. "inexpensive" -- the watch itself is NOT a cheapie: the case is solid and well made, the bracelet is study for its price, and together they give the watch a nice heft to it @121.4 grams. 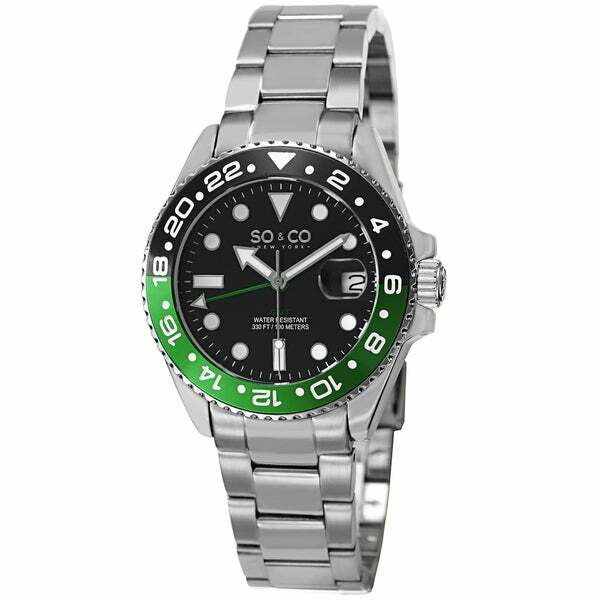 The bezel insert is well-made and are the numbers engraved into the dial; I'm not certain if the bezel insert is ceramic, as my bad eyes are of little help here; having said that, I believe the insert to be a highly polished metal one. The watch's movement is a solid, Swiss parts RONDA movement, which is a rugged workhorse of a movement, so I have the utmost confidence in it. The GMT hand works very well and is independently adjustable & tracks very well. All-in-all, this is an EXCELLENT piece of horology for the price; buyers can't go wrong with this Rolex GMT-Master II homage. This is the second SO&CO watch I've purchased recently and have just purchased another one -- the Rolex Yacht Master II homage. I expect the same quality from this as I've had from my first two purchases. I know this is a man watch, but I purchased it for myself and I am female. I love big face watches and green is my favorite color, so this watched worked out perfectly for me. The watch is too large for my arm, but I will take it to a jeweler to remove some of the links to fit my wrist perfectly. The watch has a nice weight to and it looks more expensive than it is. It took me a minute to figure out how to set the date and time on this watch. You have to unscrew the dial on the side which will allow you to pull it a little to set the time, you will then have to pull it out a little further to set the date. The watch came partially unassembled so be prepared to finish attaching the bracelet part of this watch. All in all I really love this watch and very satisfied with my purchase. This watch is very attractive and you get a lot of watch for the price. My wrist is 7.25 inches and the size of this watch is just perfect. When adjusting the bracelet it ends in the middle of the wrist thanks to the micro adjusting wholes. It keeps the time very accurate. The bezel is a little stiff from the factory, sort of, you have to break it in, but after you use it is just right. I gave it a 4 because the numbers alignment on the bezel are not perfect, but hey, it is not a Rolex. Good watch. This watch looks and feels great,i am enjoying and getting lots of compliments....the price was so inexpensive at least $** cheaper than ****...had trouble picking the green...there is a blue and a red model too.There have been mixed reviews about this watch,it's no rolex,but at this price who cares!!! This watch is really nice and happy with my purchase. It came in delivered wrapped nicely. Nice looking watch with a weight to it. Stylish,good heft. Should prove to be an awesome watch ! Should be great for hiking, camping, boating !!! Can't believe the affordable price !! Look forward to more great Overstock deals like these !!!! My husband loves this style.